Our 2013 Show Season was very gratifying - winning 33 Broad Ribbons at 11 Shows. Whilst it is nice to win broad ribbons, the pleasure is not related so much to the actual number of broad ribbons. 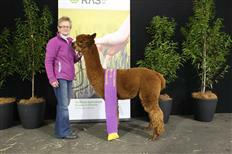 The pleasure comes from the fact that the 33 broad ribbons, won at both Coloured and Age Championship shows, were won by 11 MillDuck bred alpacas – ten having MillDuck genetics on both sides of their parentage. MillDuck Oregon was a star at Colourbration. In 2012 he won Champion Brown Male; however in 2013 went one step further winning Supreme Brown. A few friendly ‘digs’ were received when MillDuck entered a “white” at Colourbration. 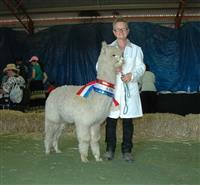 This alpaca was placed 2nd in the highly competitive Junior White Female class. Quentin Bryce went on to be placed 4th in the Junior White Female class (34 entries) at the Nationals and has subsequently won two Champion Junior Female awards. We can’t wait to see what Quentin (affectionally known as “GG”) produces when mated to one of our coloured males. 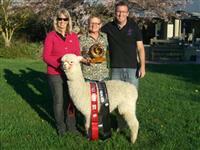 Whilst talking about “whites” – congratulations are extended to Martin & Debbie from Oak Ridge Alpacas in New Zealand. Martin & Debbie won Champion Junior Male at the 2013 New Zealand National Show with Oak Ridge Tiberius – a ‘white’ son of MillDuck Lollipop. It was wonderful to be in New Zealand for the World Conference and Expo and to witness the win (and help celebrate!!). Tiberius is not the first champion MillDuck Lollipop has produced for Martin & Debbie – the first being a dark fawn female Oak Ridge Prada. 2013 was the year of “hat tricks” for MillDuck. For the third year in a row a MillDuck alpaca won “Best Brown” at Sydney Royal Easter Show (MillDuck Oregon) and “Royal Brown” at the Melbourne Royal Show (MillDuck Pittsburgh). 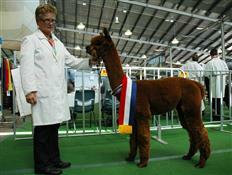 The AAA National Show in Bendigo was a “show to remember”. We entered nine animals with all nine being in the Judge’s first cut. Eight went on to win a ribbon. Being “coloured” breeders, the ultimate is winning “Best Colour in Show” at the AAA National – in our minds it is equivalent to “supreme”. 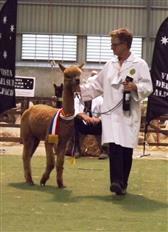 We were delighted when MillDuck Oregon won Champion Brown Male and then “Best Brown in Show”. It was extra special as Oregon won the same award in 2012 – yes, back to back “Best Brown in Show” at the Nationals. 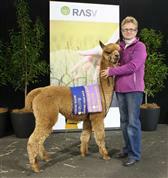 Few would dispute there was no bigger smile at the Nationals than that of Jade Lamson from Greyleish Alpacas. Jade took delivery of her new male, MillDuck Preston, on the first day of the show. We were very pleased for Jade when Preston won his Adult Black Male Class. Ecstatic for Jade when he won Champion Black Male – simply “over the moon” when he took out “Best Black in Show”. Congratulations Jade. So in summary – we had a very rewarding 2013 show season.